Daniela V. on horse Hidalgo: "The saddle is definitely an all-round talent ..."
"My horse Hidalgo and I have a longer saddle odyssey behind us, the two of us on the one hand the cavalry almost completely messed up and also physically almost ruined us. We now had several saddles, all of which were adapted by a saddler, but a disaster hunted the next. The last saddle was a measuring saddle of a renowned German company. In the saddles of this brand I personally always loved to ride and our saddle was great. A really chic and comfortable part - but unfortunately only for me as a rider. My Hidalgo always went tense and we both had great problems with the running out. I despaired slowly, as it was simply not possible for me to finish my own horse properly after several years. Hidalgo grunted as soon as I had the first kick. It was pure stress for both of us. Several times I had talked with the saddler that the saddle would not fit. The back became more and more sensitive, tensions developed in the lumbar region, and the first small atrophies were noticeable. What did the saddle manufacturer say? Either I would ride too badly or my horse would just not like a saddle. So he was through with the matter. Well, ultimately I have to sell a saddle with a bigger loss. After I've known my Hidalgo for so long, I've figured out how his saddle should be. It has to have a wide chamber, the shoulder should be enough space, be softly padded, have a wide cushion canal, have wide cushions and be flexible enough to accommodate the swing in the back. Where to take this saddle? Well, so we came to the Iberosattel. At first I was still skeptical because of the bad experience with saddles, but since we have this saddle, the riding for horse and rider has changed positively. In our Iberosattel Dressage Andaluz, I was able to sit Hidalgo for the first time. He does not get angry and he never grunted again. The saddle is definitely an all-round talent used by us for jumping and for the terrain. And there is still a big plus. When I ride other horses with their saddles, I notice the comfort of the Iberosattel for the rider. 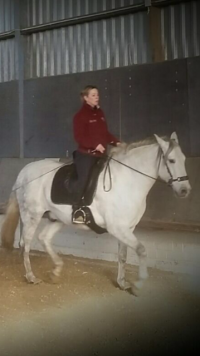 I am very happy that we have this saddle and it is a pity that we came to this saddle only 1.5 years ago." Please send me detailed brochures.